Lawyer Ömer Turanlı has called on human rights organizations and the relevant commissions of the EU to immediately monitor incidents taking place in Turkey’s prisons while expressing grave concerns about the safety of his clients due to claims of a staged riot. On Saturday, Turanlı announced from his Twitter account plans by the Turkish government to commit mass killings of people jailed over alleged or real links to the faith-based Gülen movement in a staged riot in Silivri Prison. “According to unconfirmed information my clients received from their families, officials will open the gates [of holding cells] in order for prisoners to escape as if in a prison break. And then soldiers will be ordered to shoot them,” he wrote on Saturday. In his messages on Sunday, Turanlı reiterated his concerns about the lives of his clients while calling on family members of all those arrested in Silivri to get in touch with their jailed loved ones. He also said if the gates of holding cells are opened, none of the inmates should attempt to go out. 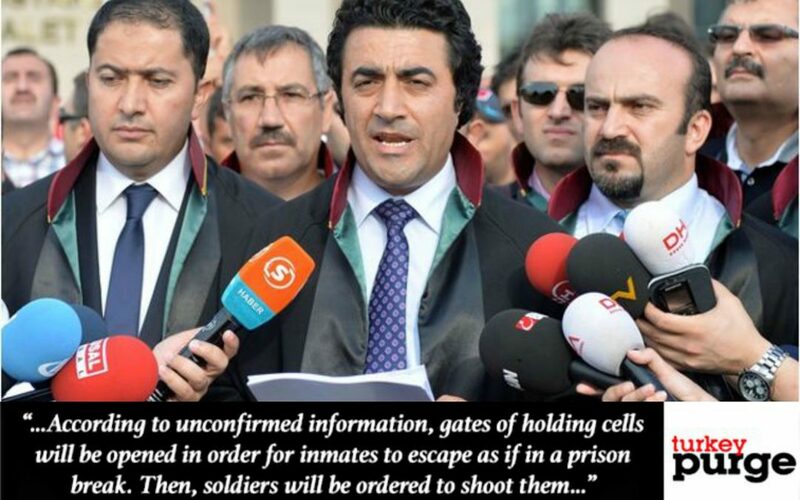 Turanlı also urged families to avoid provocation and act in line with the law. According to the lawyer, recent news reports that portrayed the sketch of an electronic circuit board as a prison break map of inmates who are imprisoned for real or alleged ties to the Gülen movement in pro-government media outlets confirm the claims about plans by the government for the mass killing of inmates. “[Pro-AKP Twitter] trolls have already written that execution teams have been set up in prisons. I am concerned about the lives of my clients,” wrote Turanlı. In September a pro-AKP Twitter troll named Ahmet Üstün (@ustunn_ahmet) called on the government to make plans for the massacre of all Gülen sympathizers who are currently behind bars. The government, which accuses the Gülen movement of masterminding a July 15 coup attempt, coined the term “FETÖ” to label the movement as a terrorist organization, and the term is abundantly used by almost all media outlets in Turkey despite the lack of any court verdict proving the existence of such an organization. Since the coup attempt, as part of a massive purge Turkey has arrested some 35,000 people over their alleged ties to the Gülen movement based on guilt by association only. Following the arrests, the pro-government media has been running stories of possible uprisings in prisons, although not a single act of resistance against detentions or arrests has taken place. Such stories raise concerns of mass killings of inmates in an effort to exterminate Gülen movement followers in prisons as final step of the massive purge. This article originally appeared in Turkish Minute on Nov. 6.